Dear Teri, thank you for the opportunity to speak to the Commissioners for the Port of Newport. The 23rd of October works for me. We believe in the Multiple Use concept of sharing the natural resources common to the Oregon Coast. 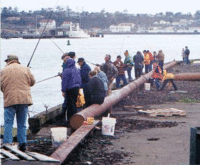 The Port of Newport has a history of public use of the natural resources associated with Yaquina Bay. Restricting public access to utilizing or sharing those resources is a recent event. There are a number of Ports in Oregon that allow the public access to the natural resources associated with those Ports. Refer to the above image showing multiple use of the Terminal Facilities. What does it take to overcome the objections of insurance companies to allow public use of out Port of Newport Facilities? We are requesting multiple use by the public of the facilities associated with the Port of Newport's International Terminals during the period when the Terminals are not being used by merchant or fishing vessels. I understand your concerns and desire to speak with the Port Commission directly. I would be happy to add you to the Port of Newport Commission agenda for the September 25th Commission meeting at 6 pm. If you would send a letter addressed to the Port Commission to the email addresses below, that will ensure each of the Commissioners receive a copy. Please also send me a copy. By sending correspondence, you will have the opportunity to speak to your request during the correspondence section of the agenda. If you choose not to send a letter, you are welcome speak during the public comment period, but you will be limited to 3 minutes. Thank you and please let me know if you have questions about any of the information above. DISCLAIMER: This e-mail may be a public record of the Port of Newport and may be subject to the State of Oregon Retention Schedule and may be subject to public disclosure under the Oregon Public Records Law. This e-mail, including any attachments, is for the sole use of the intended recipient(s) and may contain confidential and privileged information. Any unauthorized review, use, disclosure, or distribution is prohibited. If you are not the intended recipient, please send a reply e-mail to let the sender know of the error and destroy all copies of the original message.